What do YOU need to help your barbecuing and grilling adventures go smoother? 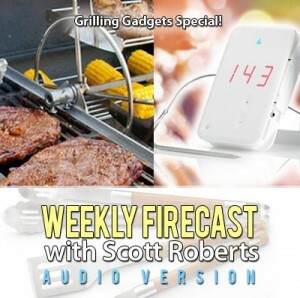 Scott interviews both Christopher Allen of iGrill, a high tech thermometer that outputs info via a mobile app, and Brian Toebben of Missouri’s Easy Grilling Products, a company that produces motorized rotisserie and rotary rack equipment that fits inside your BBQ smoker. Afterwards, Scott lists his top 10 accessories he cannot live without when he has an outdoor cookout. The review of the week is a trio of scrumptious hot sauces from Firefly Hot Sauce.